These bad boy jeans were courtesy of PacSun, one of our generous sponsors for the Weardrobe Conference. The jeans, the specimens for our DIY workshop full of studs and shredding galore, served as a blank canvas of sorts and after a mad dash of all 20 girls rushing toward the jean table, these white ones were left. I shrugged my shoulders and said, "Labor Day, Schmabor Day." I'm going to break the rule and live to tell about it. Technically though, these jeans are a work in progress. I finished the back pockets with some studding detail and wanted to add a little somethin' somethin' to the front. I started doing this pant cuff pattern but sadly, my thumbs wore out on me. Studding is a lot of work, ya know? What do you guys think? More studs or should I save my thumbs? I think they're pretty cool the way they are! great those studs! and amazing shoes and necklace. I love the white denim! The small amount of studding is perfect....leave em the way they are! I love the blazer and how fitted it is. Looks great with the white jeans! I'm going to be part of the minority and vote for moremoremoreeee. Save your thumbs! They look great the way they are! this is just right ... you dont want to overdo the studs. I love what you've done with the jeans! And I'm LOVING those sandals! More studs. I think they are just so perfect on jeans. And that necklace is bananas! Love the whole look! I think you should stud at least one whole back pocket a la hannelli mustaparta. I think that the jeans look great the way that they are, or you could add studs to the front pocket on the opposite side from where they are at the cuff, just a suggestion. But they look amazing. I like your jeans the way they are now... save the studs for something else! Beautiful blazer! Love the color. And I think those jeans look fab the way they are right now! You look great! 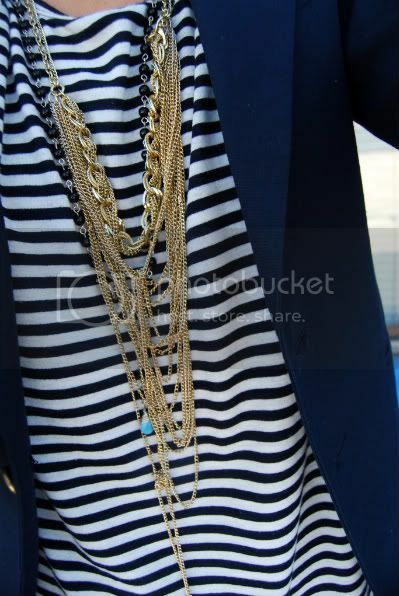 I love the strips and the layered chains. I'm with you on the whole "white after labor day" thing. Breaking fashion rules is much more fun than obeying them! I say maybe a few more studs on the front pocket opposite the ones on the leg. Great job reworking the jeans! I love what you did round the ankle! loving the white jeans and that blazer.